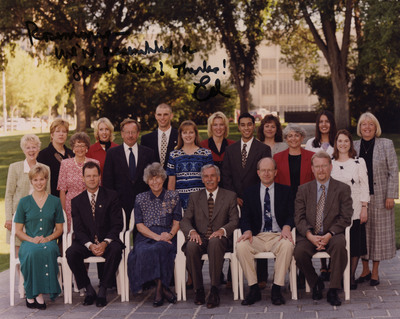 "Senior Staff of the Schafer Administration"
Photograph of Lieutenant Governor Rosemarie Myrdal, Governor Ed Schafer, and senior staff members of the administration. Caption by Governor Schafer reads: "Rosemarie - we've assembled a good crew! Thanks! Ed. "